Neighbourhood Planning is one of the new ‘rights’ introduced in the Localism Act 2011. It is a way that communities can have their say on the type of development they want to see in their area. A neighbourhood plan, once adopted, will form part of the Local Development Plan. The Localism Act assumes that, where they exist, a parish will constitute a neighbourhood. Where there is no parish (e.g. in urban areas) the community can agree with the Local Planning Authority what geographical area a neighbourhood covers. Who can do a Neighbourhood Plan? In a parish - the Town or Parish Council. If no Town or Parish Council exists a Neighbourhood Forum needs to be formed and approved. The views of the community will be gathered through a structured and inclusive consultation process and a Neighbourhood Plan will be drafted. The Neighbourhood Plan will then be subject to independent examination before finally being tested in a referendum. Assuming the Neighbourhood Plan achieves more than a 50% yes vote in the referendum it is adopted by the Local Planning Authority as part of the Local Development Plan. The outcome is that future planning applications will then be considered in accordance with the policies specified in the Neighbourhood Plan. The purpose of a Neighbourhood Plan is to help foster the economic, social and environmental wellbeing of everyone in the community. Why get involved in this? Getting involved in the Neighbourhood Plan is a great opportunity to influence how your area will grow and develop in the future. 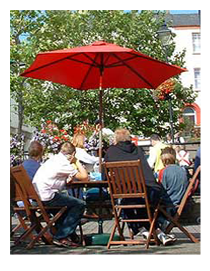 Any one in Bideford can get involved in helping to plan the future development of the area. We are current exploring the issues we wish to include in the Neighbourhood Plan. We will be inviting community groups and individuals to have an input in this. If you would like to be involved please contact us. 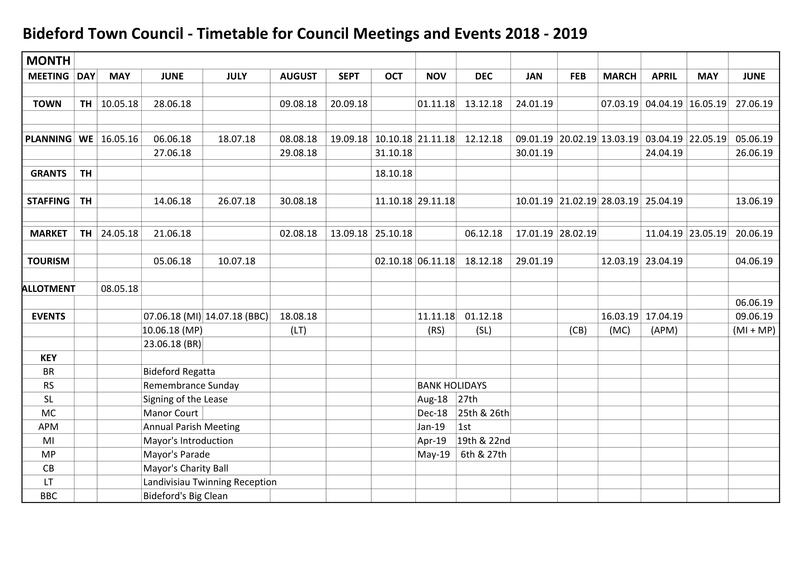 Current Agendas for all forthcoming meetings are published online. Dates, times and whether the meetings are open to the public and press are made available. The minutes for the latest meetings are published on our site so you will be able to follow decisions about planning permissions, new projects, financial decisions and community projects. Please note that due to the forthcoming Elections the Town Council Meeting which was scheduled for Thursday, 9 May 2019 will now be held on Thursday, 16 May 2019. The Planning Committee Meeting scheduled for Wednesday, 15 May will now be held on Wednesday, 22 May 2019.